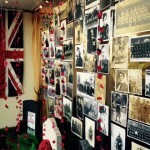 Annie Mackender, our funeral arranger at West Byfleet, was inspired by recent World War I window displays, and wanted to do something to commemorate Remembrance Day, marking the end of the war at the 11th hour on the 11th day of the 11th month. She placed requests in local shop windows asking for members of the local community to bring in photographs of family members that had served in the war. She was inundated with photographs and memorabilia and has scanned them and put into her display, and is receiving many comments from passers by.